Arrive at Yangon International Airport (the main gateway to Myanmar). Welcome and transfer to hotel. Relax and sightseeing includes; Great Shwe Da Gon Pagoda (One of the wonder of the World and itself is a solid brick stupa (Buddhist reliquary) that is completely covered with gold. It rises 326 feet (99 m) on a hill. Chauk Htat Gyi Pagoda, huge 72 metre Reclining Buddha Image. Overnight at hotel in Yangon. Breakfast at hotel and morning leave for Kyaikhtiyo by private a/c car, enjoy a scenic journey by road to Kyaiktiyo, 190km to the east. One of Myanmar’s great pilgrimage sites is the Golden Rock at Kyaiktiyo, a huge boulder covered by gold leaf and delicately balanced on the edge of a cliff. Late morning, arrive at Kyaiktiyo base camp and transfer to the transit junction with one of the small open trucks in a one hour ride. After lunch, start an easy walk up to the Golden Rock and enjoy sunset from this unforgettable site. Overnight at hotel in Kyaiktiyo. Breakfast at hotel. Then drive down to based camp and proceed to Mawlamyaing. On the way to Mawlamyaing, the scenery is interesting. Arrive at Mawlamyaing in late afternoon, visit Mahamuni Pagoda, Bamboo Buddha Image, Uzina Pagoda and Yadanabon Myint Monastery with beautiful woodcarvings showing the previous life of Buddha. Evening enjoy the sunset at Kyaiktanlan Pagoda and out across the River. Overnight at hotel in Mawlamyaing. Breakfast at hotel. This morning, visit to Mawlamyaine Market and make photo stops at some interesting old colonial-style houses, a mosque and churches. Then drive south to Win Sein Toya, near Mudon, where the largest reclining Buddha in the world is under construction. Then return back to Mawlamyaing and enjoy lunch at local restaurant. In the afternoon, drive to Than Phyu Zayet, where soilder burying-ground. And then visit to Kyaik-Kha-mi Pagoda, the pagoda surrounded by the sae water. After drive back to Mawlamyaing along the road, which are home to many pagodas and monasteries built in typical Mon style. Dinner at local Restaurant. Accommodation at hotel in Mawlamyaing. Breakfast at hotel. Continue drive to Hpa-An (01:30 hour drive approx) observe the beautiful and ornate monastery (U Nar Auk Monastery) in Kaw Nhat village. Continue visit to Kyauk Kalat Stupa which stands on a lake among the green mountains and where offering free vegetarian dish to pilgrimages. Then photo stop at Zwekabin Mountain, the significant natural hill embedded with 1000 Sal trees. Then visit to Kaw Koon Cave where Buddha figures are carved out of the wall of the cave. After continue to visit Yathitpyan Cave and evening enjoy the sunset at Shwe Yin Myaw Pagoda. Overnight at hotel in Hpa-an. Early breakfast. Return to Yangon by road. On the way, visit to Bayin Nyi Lime Stone Cave, with natural hot spring. Then continue to drive and stop in Thaton which was once the centre of a Mon kingdom that may have stretched as far east as Cambodia. You will visit, home to a famous standing Buddha stele in the classic Mon style, with interesting stone carvings dating back to the 10th Century. Arrive at Yangon in the late evening and proceed to hotel. Overnight at hotel in Yangon. After breakfast at the hotel, morning transfer to Yangon airport leave for Bagan by flight. On arrival at Bagan the local guide will welcome you and transfer to hotel. And then sightseeing inclusive of Nyaung Oo Market, Shwezigon pagoda, Kyansittha Cave, Bupaya, Myazedi Temple, Wat-gyi-inn, Arnanda Temple, Thatbinnyu, Dhammayangyi temple and Hti-lo-Min-lo Pagoda. Evening enjoy the sunset from Nyaung Lat Phat Kan Hill. Overnight stay at Hotel in Bagan. Breakfast at Hotel. Drive to Mt. Popa. Visit Popa Taungkalat and environ. After drive back to Bagan and on the way you can drink Plam wine, that is traditional alcohol in Myanmar. Overnight at Hotel in Bagan. Breakfast at hotel. Morning transfer to Jetty leave for Mandalay by Shwe-Keinnery Fleet. On the way to Mandalay you can view the way of life of Myanmar over the boat. Arrive at Bagan and transfer to hotel. Overnight at hotel in Bagan. Breakfast at hotel. Today visit to Mahagandaryone Monastery for offering alms food to thousand monks, Mahamuni Image – a bronze Buddha image castled during the lifetime of Buddha himself, Tapestry works, woodcarving & bronze castling workshops, Marble carving workshop and silk weaving home cottage. After lunch, visit Sagaing environ, Kaungmudaw Pagoda and transfer to jetty for a boat to Inwa, visit MahaAungMyayBonzan Monastery, Nan Myint Tower and BagayarKyaung, the teak wood monastery. Enjoy sunset at U BeinBridge.Transfer to hotel and overnight in Mandalay. Breakfast at Hotel, then drive to Mandalay jetty to Mingun, visit Mingun Bell, Settawya Pagoda and Hsinbyume Pagoda by boat across the Ayeyarwaddy River and romatic country side. Then back to Mandalay by boat. 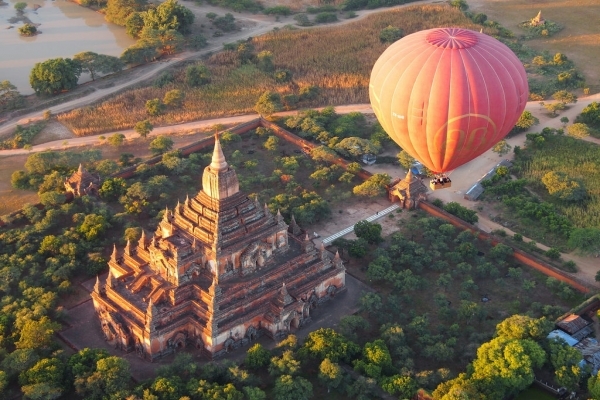 After lunch continue to visit Mandalay Palace, Shwenandaw Monastery, Atumashi Monastery, Kuthodaw Pagoda known as the biggest book and scenery tour by visiting Mandalay hill to enjoy the sunset. After that transfer to hotel and overnight in Mandalay. Breakfast at hotel. Transfer to airport for Heho. Arrive and drive to Pindaya sightseeing; Pindaya Caves, Pontaloke Lake and study of hand make umbrella at a local house. Then continue drive to Kalaw and transfer to hotel overnight in Kalaw. Breakfast at hotel. Drive to the starting point for the trekking. Begin the trek and Lunch at Myin-Ma-Hti Cave, then proceed to La-Mie village en route, you can see various ethnic tribes such as Pa-O, Taung-Yo and Bamar and the plantation of vegetables and stay overnight at Baw-Hnin-Kone village. After breakfast, start a walk to Yay-Ni village, Myay-Phyu village, Taung-Mauk village and End at Indein village and transfer to hotel by boat. Overnight in Inle. Breakfast at hotel. Take a boat sightseeing on the lake; the Intha people, mostly inhabit the lakeshores and floating villages. including a chance to see the leg-rowing fishermen, the floating gardens, built up from strips of water hyacinth and mud and anchored to the bottom with bamboo poles. Then continue to PhaungDawOo Pagoda, weaving village of Impawkon and Nga-pe-chaung monastery which was built 15 years earlier than Mandalay Royal Palace. Transfer back to hotel and stay overnight in Inle. Breakfast at hotel. Transfer to airport for Kyaing Tong. Arrive at Kyaing Tong Airport in the afternoon and transfer to your hotel. Drive through Kyaing Tong to Lake Tong, the centre of the city. A nice path goes around the lake. Dinner and accommodation at hotel in Kyaing Tong. Enjoy breakfast at hotel. This morning drive out of Kyaing Tong toKattauk Village and then to Pin Tauk Village. In Pin Tauk village, Akha and Lahu people have converted to Baptism and they have built a church in the middle of the village. Then to Wan Ping Village, where people still wear their traditional dress, and start a trekking tour. Enjoy a packed lunch.In the afternoon, visit Wanlar, whose residents are famous for their bird hunting. Continue to Nam Lin Kaung, an Ann village where the residents are still animist and dress in their traditional black costumes and paint their teeth black. Then to Nam Lin Mai, which is very nicely located on a plateau overlooking the rice terraces, surrounded by shady trees. Walk back to your car and drive back to Kyaing Tong. Dinner and accommodation at hotel, Kyaing Tong. Enjoy breakfast at hotel. Drive out of Kyaing Tong and visit to Hokyin Mountain. Visit around the tribal villages and enjoy a packed lunch on the way. In the afternoon, drive back to Kyaing Tong. One the way back to Kyaing Tong visit U MuleinDa’s Unique Shan Lacquer Ware Shop and Lone Tree Hill for views over the surrounding countryside and Kyaing Tong. Then drive back to your hotel. Dinner and accommodation at hotel, Kyaing Tong. Enjoy breakfast at hotel. This morning, visit Kyaing Tong Market where minority people come to town to shop or to sell their goods. Visit others interesting places and lunch at local restaurant. In the afternoon, transfer to Kyaing Tong Airport for your flight back to Yangon. Arrive at Yangon Airport and transfer to your hotel.Overnight in Yangon. Breakfast at hotel. Transfer to airport for Sittwe. Arrive and transfer to hotel. Afternoon sightseeing; Mahakuthala monastery (Buddhist museum), U Ye Kyaw Thu Monastery (Colonial Style building), ByaYarGyi (Bronze Buddha Image), Lawkanandar Pagoda, Sunset at View Point (Sea beach).Overnight in Sittwe. Breakfast at hotel. Transfer to Jetty. Take a locally designed boat trip in the river Kaladan. With luck you will see dolphins and rare birds, villages along the shore, white-washed pagodas, and ancient sampans on their way from here to there. You will reach MraukOo. Transfer to hotel and afternoon visit to MunKhaungShwe Du (17th century) sand stupa, Pisi ruined Temple with 5 monokith images of LaymyodynastryPrbior to MraukOo Dynasty, Immense Kothaung cave temple of 16th century (Resemble Borobudur of Java) Ruined Temple. Sunset at HarriTaung Hill.Overnight in Mrauk U. Breakfast at hotel.Morning leave to Nan Kyar Village by car. It will take 30 minutes. When you reach Nan Kyar village, you go to Chin village by boat. It is 2:30 hour trip to Chin village. You will see way of life of chin people, tattoo women with big ear rings, local style of Bamboo house and the beautiful scenery of Lay Myoriver. You can have your lunch at Chin village. After lunch, back to MraukOo and transfer to hotel. Overnight in Mrauk U. Early morning get up and transfer to jetty. Take a boat to Sittway. Arrive and transfer to airport for Thandwe(Ngapali Beach). Arrive at Thandwe airport and transfer to hotel. Leisure and overnight at hotel in Ngapali Beach. Breakfast at hotel. Day at leisure in Ngapali Beach. Overnight at hotel in Ngapali Beach. Breakfast at hotel. Then transfer to airport leave back for Yangon by flight. Arrive back for Yangon and transfer to hotel. Then sightseeing includes Kaba Aye (World Peace) pagoda, Maha Pasana Cave, Buddha’s Tooth Relic Pagoda and Jade Factory, Sule Pagoda, the heart of Yangon City surrounded by memorable scene of various Colonial style buildings. Overnight at hotel in Yangon. Breakfast at hotel. If time allow, free time for shopping at Bogyoke Market (formerly Scott’s Market). Then transfer to Airport for departure.